The 13-inch display with a resolution of 1,920x1,080p looks crisp, and offers wide viewing angles. Notebooks are getting smaller and easier to carry. Asus’ new ZenBook 13 series is a case in point. Its UX331UAL-EG001T variant, priced at ₹ 66,990, shows one doesn’t need to spend a lot to get them. Design: Wrapped in an aluminium chassis carved out of a single block, the new ZenBook 13 feels immensely premium, while the rose gold and deep dive blue finish brightens the overall looks. It is surprisingly compact and light (985g) for a 13 inch Notebook and can slide comfortably into the smallest of backpacks. The speakers are oddly placed at the base, as a result the audio isn’t very clear. We had to fall back on the headphones to watch movies or videos. Display: The 13-inch display with a resolution of 1,920x1,080p looks crisp, and offers wide viewing angles. 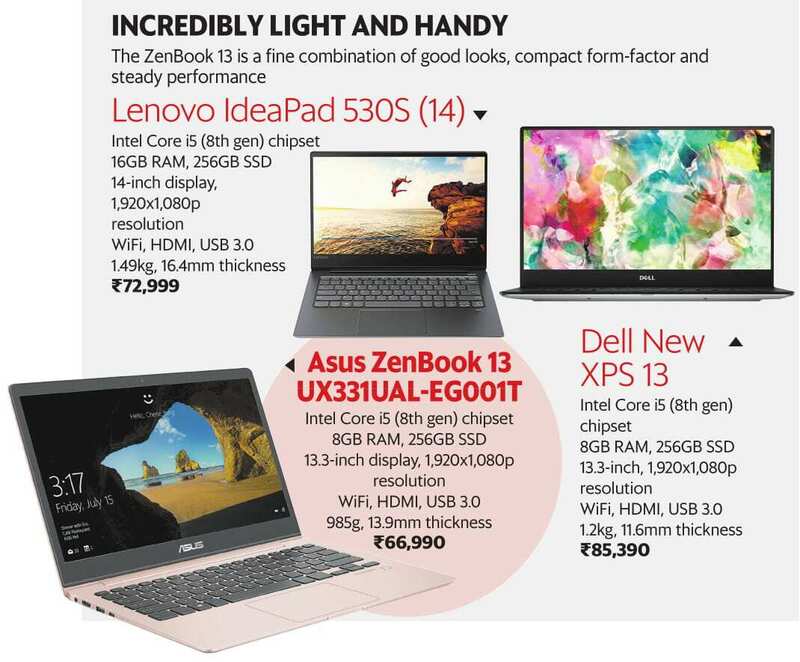 While colours look good, it lacks the vividness of the more expensive Dell New XPS 13 (₹85,390). The thin bezel design, gives it an edge-to-edge look. Keyboard and connectivity: The keyboard has been designed very well. The keys look big and well spaced, allowing users to type fast without straying on to the adjoining keys. They are also backlit which means that one can type in the dark with the same ease as in a well-lit room. Connectivity options include HDMI and USB. There is no LAN port, however, Asus is bundling a free USB to LAN converter with the notebook. Performance: The notebook runs on Intel’s 8th gen Core i5 chipset with 8GB RAM and Windows 10 Home OS atop. It handled most tasks comfortably . The 256 GB SSD isn’t much for users who like to tow away a lot of photos, offline movies and music. However, it ensures the apps and OS will boot up a lot faster than HDD notebooks. In terms of battery backup, one can get 5-6 hours out of non-stop use. Verdict: The ZenBook 13 is one of the most ergonomic friendly and thin notebooks at the given price point.